Farm to Cafeteria Canada (F2CC) is a pan-Canadian organization whose vision is “vibrant and sustainable regional food systems that support the health of people place and planet.” F2CC works with partners across Canada to educate, build capacity, strengthen partnerships, and influence policy to bring local, healthy, and sustainable foods into all public institutions. F2CC collaborates with principal partner organizations to secure funds to establish and evaluate promising F2C practices with a view to informing policy. F2CC hosts a pan- Canadian Network – and maintains a comprehensive e-platform to share knowledge information and resources amongst members. Farm to School, Farm to Campus and Farm to healthcare are all a part of the national Farm to Cafeteria Canada dialogue. 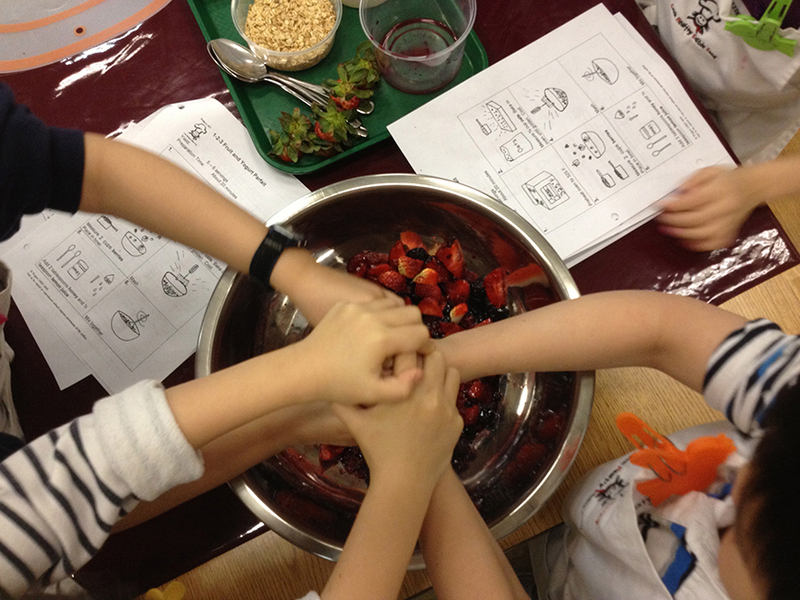 F2CC Farm to Cafeteria Canada is proud to lead the national Farm to School movement. Vibrant local sustainable food systems that support the health of people, place and planet. local, healthy and sustainable foods into all public institutions. Goal 1: Catalyze, support and sustain organizations in their work to develop knowledge, build skills and operate Farm to Cafeteria activities and programs. Goal 2: Influence policy, conduct research and advocate to make it easier for public agencies to acquire and serve local, healthy and sustainable food. Goal 3: Raise awareness about farm to cafeteria work and Farm to Cafeteria Canada. 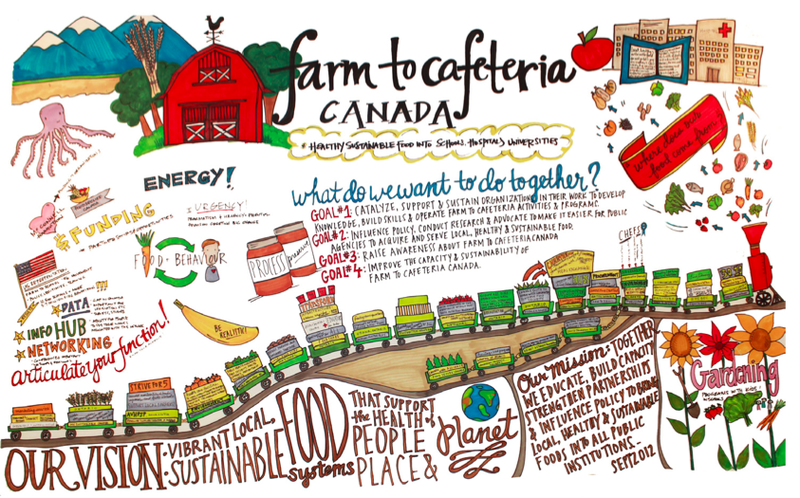 Goal 4: Improve the capacity and sustainability of Farm to Cafeteria Canada. To see the accompanying objectives and strategies for each of these goals, see Farm to Cafeteria Canada’s Strategic Plan. We value local, healthy and sustainable food, because we understand it to be integral to the health of people, place and the planet. We respect the planet and believe that working together to improve our public institution cafeterias results in reductions of our community’s ecological footprint. We recognize the multi-cultural nature of Canada and we pledge ourselves to creating and maintaining initiatives that respect diverse traditions, heritages and life experiences. We believe in the importance of collaboration across geography and organizational boundaries and the building of vibrant connections to the places and people we represent. We are dedicated to achieving our goals and having positive and lasting impacts in public institution cafeterias. We continually communicate with, listen to and learn from one another and other stakeholders in the farm to cafeteria movement while seeking opportunities to act together in ways that mutually reinforce our shared goals. We celebrate everyone’s accomplishments in the farm to cafeteria movement and value having fun together. We are adaptive and act with integrity in the face of adversity while persevering in the pursuit of our vision, mission, and values. We are accountable to our stakeholders and project collaborators and we report on our activities in a manner that is transparent and accessible. We value grass-roots action and local community organizing and we work to support capacity building so all communities in Canada can lead the farm to cafeteria movement in Canada. We believe that everyone has the right to access local, healthy and sustainable food in public institutions. We also believe that everyone has the responsibility to help change our public institutions so this right can become a reality for everyone.